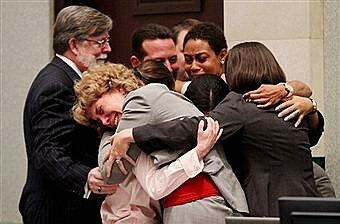 Do You Agree With The Casey Anthony Jury? The verdict is in. "Not Guilty." Doesn't mean innocent, just not guilty. Lots of people called us on the Andy and Chuck WTRV morning show today to say they don't believe the jury. The public doesn't seem to agree with jurors in the Casey Anthony case. People began weighing in on the matter in polls across the country following the verdict, in which an Orlando, Florida jury found Anthony not guilty of murder, child abuse, or aggravated manslaughter in connection with the 2008 death of her two-year-old daughter Caylee. More than three-quarters of those answering an online survey from Alabama's "Press-Register" say they believe Anthony is guilty. Three out of four respondents to a SignOnSanDiego.com survey and 81-percent taking part in a Cleveland.com poll also say they do not "agree with the verdict." Even in an online poll from the "Orlando Sentinel," which is based in the community where the trial took place, 77-percent feel the prosecution's case was "strong enough for a guilty verdict." Just 23-percent didn't think prosecutors presented evidence that proved Anthony's guilt "beyond a reasonable doubt." However, an overwhelming majority of those participating in a "New York Daily News" online poll believe justice was served, with 94-percent saying they think the correct verdict was reached.